More than half of long-term brain tumor survivors develop irreversible cognitive decline that severely affect their quality of life. However, there is no pre-clinical model that allows long-term assessment of cognition, and there is no treatment which ameliorates cognitive deficits in patients. Here, we report a novel glioma mouse model that offers manageable tumor growth and reliable assessment of cognitive functions in a post-treatment manner. Using this model, we found that fractionated whole-brain irradiation (fWBI), but not tumor growth, results in memory deficits. Transient inhibition of CSF-1R during fWBI prolongs survival of glioma-bearing mice and fully prevents fWBI-induced memory deficits. This result suggests that CSF-1R inhibition during radiotherapy can be explored as an approach to improve both survival and cognitive outcomes in patients who will receive fWBI. Taken together, the current study provides a proof of concept of a powerful tool to study radiation-induced cognitive deficits in glioma-bearing animals. Cranial radiotherapy for brain tumor patients is usually fractionated into a series of lower doses in order to reduce radiation-induced normal tissue injury. However, cognitive deficits are still seen in more than half of the patients who received fractionated whole brain irradiation (fWBI) (Meyers and Brown, 2006; Greene-Schloesser and Robbins, 2012). Despite an overall poor longterm outcome, each year approximately 100,000 brain tumor patients survive long enough to experience radiation-induced cognitive deficits in the US alone (Greene-Schloesser and Robbins, 2012). The quality of life of these long-term survivors is severely affected by the impairments in cognitive function. Unfortunately, there is no treatment to ameliorate these adverse effects. The mechanisms responsible for the loss of cognitive function after fWBI are not well understood. Previous studies have shown that single fraction of WBI induces a number of deleterious effects, including changes in neurogenesis and neuronal structures, activation of microglia and astrocytes, and accumulation of peripheral immune cells in the central nervous system (CNS) (Monje et al., 2002; Mizumatsu et al., 2003; Monje and Palmer, 2003; Monje et al., 2007; Rola et al., 2007; Monje, 2008; Fike et al., 2009; Morganti et al., 2014; Feng et al., 2016). We have previously demonstrated that fWBI, simulating a clinical treatment schedule, recapitulates the findings observed with a single fraction of radiation. From a mechanistic perspective, there is considerable evidence that the activation of inflammatory pathways is a critical factor in the initiation of radiation-induced brain injury (Morganti et al., 2014; Acharya et al., 2016; Feng et al., 2016; Moravan et al., 2016). The Colony-Stimulating Factor 1 (CSF-1) is a cytokine involved in the recruitment/activation of myeloid cell precursors to areas of injury. We have shown that using a CSF-1 receptor (CSF-1R) inhibitor during fWBI resulted in a transient depletion of microglia, a lower number of activated microglia, and lower numbers of inflammatory monocyte accumulating in the CNS. More importantly, use of a CSF-1R inhibitor fully prevented radiation-induced long term cognitive impairments in mice (Acharya et al., 2016; Feng et al., 2016). However, since activated microglia and peripherally-derived monocytes are often recruited secondary to initiation and growth of brain tumors (gliomas in particular), it is not clear whether radiation-induced cognitive changes are modified or attenuated in tumor-bearing animals (Pyonteck et al., 2013; Stafford et al., 2016). Demonstrating a rescue of cognitive function following radiation in the setting of brain tumors would have significant translational impact. Cognitive studies in glioma animal models following radiation treatment have not been previously reported. The primary reason is the technical challenge of producing a glioma-bearing animal that survives sufficiently long enough for cognitive assessment. Low grade glioma models tend to have long, and unpredictable tumor onset with variable growth rates, while high grade glioma models tend to be aggressive with an insufficient time window to permit assays of cognitive function (Chen et al., 2012). Most models using human xenografted tumors require an immunodeficient host, which would severely limit the ability to study the role of the immune system in cognitive function. Finally, transgenic mouse models have an inherent inconsistency in tumor development and progression which would preclude the ability to perform cognitive testing at predictable times following radiation treatment. To avoid these limitations, we used a novel high-grade glioma model that allows manageable tumor growth, and feasible assessment of long-term cognitive outcomes. We tested the survival and recognition memory performance 1 month after fWBI and CSF-1R inhibitor treatments. We found that fWBI or CSF-1R treatment alone significantly prolonged the survival of animals after tumor implantation. However, strikingly, memory deficits were detected only in mice received fWBI but not in non-irradiated tumor bearing mice. Finally, we demonstrated that CSF-1R inhibitor treatment was able to prevent fWBI-induced memory loss in glioma bearing animals. To create a growth-manageable glioma model we stably transfected Diphtheria Toxin Receptor (DTR) into GL261-luc cell line (Figure 1—figure supplement 1). When injected into the mouse brain, the GL261-DTR cells formed tumors indistinguishable from non-DTR expression GL261 cells (data not shown). Six doses of DT injection at 1 µg/mouse/daily significantly prolonged the survival of tumor bearing mice (Figure 1A), and resulted in delayed increase of bioluminescence imaging (BLI) signals from tumor cells (Figure 1B). Survival was further improved when DT treatment was combined with fWBI (Figure 1A). This regimen (DT treatment and fWBI) resulted in a more dramatic decrease in BLI signals from tumor cells; and a new round of DT treatment (1 µg/mouse every other day) slowed tumor growth in four of the five mice with recurrent tumors (Figure 1C). These results demonstrate that the GL261-DTR glioma model has a predictable and manageable pattern of tumor growth in vivo, which allows delayed cognitive assessments. GL261-DTR model allows manageable tumor growth. (A) Survival curve of mice injected with GL261-DTR cells and the response to DT or combined DT and fWBI treatments. DT treatment was given at 1 ug daily between Day 7 and 12, the combined DT and fWBI treatment group received extra DT treatment at 1 ug every other day between Day 31 and 45. **ptumor + DT = 0.0076, **ptumor + DT + fWBI=0.0033, Mantel-Cox Log-rank test compared to the tumor only group. (B) BLI of the tumor only and the tumor +DT groups. DT treatment resulted in delayed tumor growth. (C) BLI of mice received combined DT and fWBI treatment. Irradiation further delayed tumor growth, and extra DT treatment was able to delay growth of tumors when they recur. (tumor only no treatment control, DT and DT +fWBI treatments were randomly allocated among tumor bearing mice, N = 5 – 7 each treatment group, median survival is labeled next to the curve of each group, sample size was selected to minimize the number of animals used for this pilot experiment. The medium survival of DT treated tumor bearing mice was extended to 31 days (Figure 1A). DT treatment was able to temporarily inhibit tumor growth, as evidenced by reduced BLI signals compared to the non-treated group (Figure 1B). No side effects beside moderate weight loss (<10%, data not shown) were observed in DT treated mice. In the DT + fWBI group, higher efficacy of tumor growth inhibition was achieved (Figure 1C). This paradigm further extended the medium survival to 46 days, more than 4 weeks after the completion of fWBI (Figure 1A), thus permitting assessment of cognitive function in these mice at a timepoint that matches our previously reported results using tumor-free models (Belarbi et al., 2013; Feng et al., 2016). We used the Novel Object Recognition (NOR) test to measure recognition memory performance, which partially depends on hippocampal function, in another group of GL261-DTR bearing mice between day 13 and day 16 after tumor implantation. Strikingly, no recognition memory deficits were detected in these mice despite of tumors in their brains (Figure 2A). A previous report demonstrated hippocampal dysfunction in mice with subcutaneous sarcoma (Yang et al., 2014). In their study, Yang et al demonstrated that there is increased plasma and hippocampal IL-6 concentrations in sarcoma bearing mice compared to tumor-free animals, as well as elevated plasma corticosterone levels. These changes in immune and endocrine systems induced neuroinflammation and were responsible for the observed cognitive deficits. It has been reported that GBM growth can lead to increased plasma IL-6 levels (Lamano et al., 2017). However, it is not known whether hippocampal IL-6 levels are also increased with GBM growing in the right frontal cortex. Due to the different strain, age and gender of mice used between the current study and the one reported by Yang et al, it is difficult to make an adequate comparison. It is worth noting that memory deficits are seen in brain tumor patients prior to treatments, but only when brain regions involved in memory functions are directly disrupted by glioma growth (van Kessel et al., 2017). Concordantly, in our GL261-DTR glioma model, the tumor growth in the right frontal cortex does not affect recognition memory. CSF-1R inhibitor treatment improves survival and prevents fWBI-induced memory deficits in glioma bearing mice. (A) No memory deficits were seen in GL261-DTR bearing mice at 16 days after tumor implantation. ns = not significant, ****p<0.0001, paired t-test. N = 5, error bars show mean ±SEM (B) Improved survival of GL261-DTR bearing mice with concurrent DT, fWBI and/or CSF-1R inhibitor treatment. Timeline of treatments and behavior tests are labeled on the X-axis. Novel Object Recognition (NOR) tests were performed between day 28 and 31, or day 46 and 49, for the tumor +DT group or all other groups, respectively. *ptumor + DT + fWBI=0.0178, *ptumor + DT + PLX = 0.0167, **ptumor + DT + PLX + fWBI = 0.0029, Mantel-Cox Log-rank test compared to the tumor +DT group, survival curves show combined results from two independent experiments, N = 11–15. (C) The results of NOR tests, recognition memory was impaired by fWBI, and CSF-1R inhibitor treatment during fWBI was able to prevent this impairment. The tumor +DT + fWBI group showed memory deficits, this was prevented by CSF-1R inhibitor treatment, combined results from two independent experiments, N = 8–12, ns = not significant, **ptumor + DT = 0.0011, ***ptumor + DT + PLX=0.0006, ***ptumor + DT + PLX + fWBI = 0.0001, paired t-test. All treatments were randomly allocated among tumor bearing animals. F = familiar object, N = novel object. CSF-1R is expressed in microglia, peripheral monocytes/macrophages and tumor associated macrophages. Pharmacological inhibition of CSF-1R has shown advantages in preventing cranial irradiation-induced cognitive deficits in tumor-free models (Acharya et al., 2016; Feng et al., 2016), prolonging survival in glioma-bearing mice (Pyonteck et al., 2013), and delaying the recurrence of glioma after radiotherapy (Stafford et al., 2016). Next, we tested possible treatment interactions using single and combined treatments of DT, CSF-1R inhibitor and fWBI. Treatment with fWBI alone was able to improve survival after tumor implantation, but not to the extent of DT treatment alone, while combined DT and fWBI treatment resulted in better survival than either single treatment (Figure 2—figure supplement 1A). CSF-1R inhibitor treatment alone did not prolong survival of tumor bearing mice. With combined CSF-1R inhibitor and fWBI treatments, survival was significantly improved compared to inhibitor alone, but was not significantly different from fWBI alone (Figure 2—figure supplement 1B). Therefore, DT, but not CSF-1R inhibitor, acted as a radiosensitizer in our GL261-DTR model, which allowed us to extend survival of tumor bearing mice long enough for cognitive assessment. In light of these results, we tested the effects of CSF-1R inhibition on cognition in GL261-DTR bearing mice after DT and fWBI treatments. We found that DT +fWBI or DT +CSF-1R inhibitor treatment significantly improved survival in the GL261-DTR model (Figure 2B, blue and green lines). Combined DT, CSF-1R inhibitor and fWBI treatment did not improve survival time of tumor bearing mice (Figure 2B, black line). Most importantly, CSF-1R inhibitor treatment was able to prevent memory deficits induced by fWBI in tumor bearing mice (Figure 2C). There was no difference in velocity or time spent in the center of arena (Figure 2—figure supplement 1C and D) during the test trials, suggesting that no motor dysfunction or increase of anxiety was caused by tumor growth or treatments at the time of Novel Object Recognition (NOR) test. 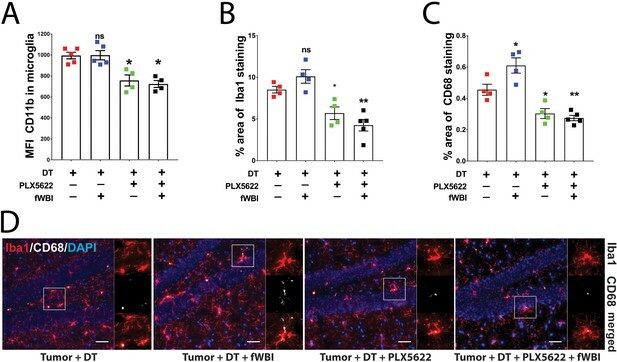 These results demonstrate for the first time that tumor-bearing mice are susceptible to fWBI-induced memory deficits, and temporary inhibition of CSF-1R during fWBI is sufficient to prevent radiation-induced deficits. Similar to the tumor-only group, animals in the tumor +DT group also showed no recognition memory deficits (Figure 2C), further demonstrating that glioma growth does not affect recognition memory. Increased CD11b expression level has been used as an indicator of microglia activation during CNS inflammation (Hoogland et al., 2015). To determine the activation status of microglia and their response to CSF-1R inhibitor treatment in the presence of brain tumors, we compared mean fluorescent intensity (MFI) of microglial CD11b using flow cytometry analysis 22–24 days after tumor transplantation (Figure 3—figure supplement 1). We found no significant change in microglial CD11b MFI after irradiation compared to non-irradiated mice. Conversely, CSF-1R inhibitor treatment resulted in significant reduction of CD11b MFI compared to untreated groups (Figure 3A). Immunofluorescent staining for Iba1, a macrophage specific marker, revealed that no morphological changes of hippocampal microglia were induced by irradiation (Figure 3D). However, there was a trend for an increase in the Iba1 stained area in the hippocampus, which was reveresed by CSF-1R inhibitor treatment (Figure 3B). Co-staining for microglia activation marker CD68 suggest that radiation induced a significant increase in activated microglia, which was significantly reduced in animals treated with CSF-1R inhibitor (Figure 3C). Consistent with the CD11b results, the immunohistochemistry data suggest that treatment with CSF-1R inhibitor reduced microglial reactivity in the hippocampus. Previous reports have demonstrated that cranial irradiation induces morphological changes that correlate with microglia activation, including increased Iba1 +and CD68+cell numbers and staining coverage (Chiang et al., 1993; Acharya et al., 2016). Taken together with the present results, this work confirmed that cranial irradiation induced microglia activation can be prevented by CSF-1R inhibitor mediated depletion in the presence of brain tumors. CSF-1R inhibitor treatment prevents fWBI-induced microglia activation in glioma bearing mice. (A) Plots of the CD11b mean fluorescent intensity of microglia in the contralateral hemisphere of tumor bearing mice. There was significant decrease of microglial CD11b MFI in CSF-1R inhibitor treated mice. there was significant CSF-1R treatment effect F(1,14) = 38.77, p<0.0001 with no significant fWBI effect or interaction. (B) Quantifications of Iba1 +signal covered area. two-way ANOVA revealed significant PLX5622 treatment effect, F(1,13) = 39.14, p<0.0001, no significant radiation effect F(1,13) = 0.01122, p=0.9173 and significant interaction between PLX5622 treatment and fWBI, F(1,13) = 4.793, p=0.0474. There was a trend of increase in the tumor +DT + fWBI group (p=0.3044), and significant reduction in the tumor +DT + PLX group (*p=0.0381) and the tumor +DT + PLX+fWBI group (**p=0.0017), compared to the tumor +DT group. (C) Quantifications of CD68 +signal covered area. Two-way ANOVA revealed significant CSF-1R inhibitor treatment effect, F(1,13) = 53.07, p<0.0001, no significant radiation effect F(1,13) = 3.559, p=0.0817, and significant interaction F(1,13) = 7.529, p=0.0167. (D) Representative images of Iba1 and CD68 staining, showing Iba1 staining in red, CD68 staining in white and DAPI in blue. Scale bar = 50 um. (A-C, Two-way ANOVA with Dunnett’s multiple comparisons test vs the tumor +DT group, ns = not significant, *p<0.05, **p<0.01. each dot represents value from one mouse (A) or the mean values of Iba1 and CD68 (B and C) staining quantification of 3 snapshots in the hippocampus, N = 4–5. Error bars show mean ±SEM. fWBI-induced cognitive deficits has been shown to correlate with increased monocyte accumulation in the CNS (Morganti et al., 2014; Moravan et al., 2016). We next examined the myeloid composition (namely, resident microglia and peripherally derived macrophages) in the contralateral brains at 6–8 days after the completion of fWBI (see Figure 3—figure supplement 1 for experimental timeline). 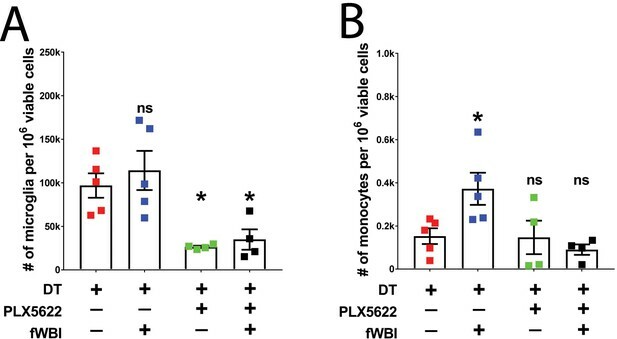 fWBI induced significant increase of peripherally derived monocytes in the contralateral brain hemisphere to the tumor (Figure 4B). Treatment with the CSF-1R inhibitor induced a partial depletion of microglia, in both irradiated and non-irradiated mice (Figure 4A) and prevented radiation-induced infiltration of peripherally derived monocytes (Figure 4B). These results are in line with our previous findings in a tumor-free radiation model (Morganti et al., 2014; Feng et al., 2016). However, in the ipsilateral hemisphere inflammatory monocyte numbers correlate with the size of tumors (Figure 4—figure supplement 1). Taken together, these results suggest that changes in contralateral myeloid cells are unaffected by the growth of tumors in the ipsilateral brain hemisphere. Treatment with a CSF-1R inhibitor alters myeloid cell composition in the contralateral hemisphere. (A) Plot of microglia (CD11b + CD45 lo) numbers in treated tumor bearing mice. There was significant CSF-1R inhibitor treatment effect (F(1,8) = 31.45, p=0.0005), but no significant radiation effect or interaction between these two treatments. Two-way ANOVA with Dunnett post-hoc comparisons against the tumor +DT group, ns = not significant, *p<0.05. (B) Plot of inflammatory monocyte (CD11b + CD45hiLy6Chi) numbers in treated tumor bearing mice. There was significant radiation effect (F(1,8) = 10.68, p=0.0114) and CSF-1R inhibitor treatment effect (F(1,8) = 23.49, p=0.0013), as well as significant interaction (F(1,8) = 5.52, p=0.0467) between these two treatments, two-way ANOVA with Dunnett post hoc comparisons against the tumor +DT group, ns = not significant, *p<0.05. Error bars show mean ±SEM values. Each dot represents cell count from a mouse, N = 4–5. Collectively, we report a novel high-grade glioma model with tumor removal followed by fWBI. The GL261-DTR model allows manageable tumor growth, prolonged survival and feasible assessment of cognition in a post-treatment manner. Using this model, we confirmed findings previously reported in tumor-free models, including increased monocyte accumulation in the CNS and elevated microglia activation. However, strikingly, we found that glioma growth in the frontal cortex does not affect recognition memory. On the contrary, it was the fWBI that induced recognition memory deficits in these tumor-bearing mice. To our knowledge, this report provides the first evidence that CSF-1R inhibition is able to prevent fWBI-induced cognitive deficits in tumor-bearing animals. It is important to acknowledge that the cell line used for the GL261 model is driven by KRAS and p53, a combination of mutation rarely seen in human glioma patients. These differences in genetic and molecular features may affect the inflammatory microenvironment of the tumor (Mackay et al., 2018), and in turn influence cognitive outcomes measured in this study. Further studies using genetically modified mouse glioma models that faithfully recapitulate molecular features in glioma patients would help clarify this concern. In addition, given the existence of Cre-inducible DTR transgenic mouse strains and the fact that human cells intrinsically express DTR, our model could be adapted to other primary mouse brain tumor models as well as xenograft models. Therefore, the current study provides a proof of concept of a powerful tool to study radiation-induced cognitive deficits in glioma-bearing animals. All animal experiments were conducted in compliance with protocols approved by the Institutional Animal Care and Use Committee at the University of California, San Francisco (UCSF), following the National Institutes of Health Guidelines for animal care. 11 weeks-old C57BL/6J male mice were purchased from the Jackson Laboratory, and housed in UCSF animal facility for one week before tumor transplantation. Control and PLX5622 (300 ppm formulated in AIN-76A standard chow, Research Diets, Inc.) chows were provided by Plexxikon Inc (Berkeley, CA). Approximately 1.2 mg of PLX5622 was ingested by each mouse per day (calculation based on 4 g/mouse chow daily). DT (Sigma-Aldrich) was dissolved in sterile saline at 10 µg/ml. 6 injections of 100 µl DT solution was given to each mouse by intraperitoneal injection every day between day 7 and day 12 (Figure 1), or every two days between day 7 and day 17 (Figures 2–4) after tumor implantation. mice were anesthetized and received 10 Gy head-only irradiation in three fractions from a cesium-137 source as previously described (Feng et al., 2016). The GL261 cells were obtained from the NCI-Frederick DCTD tumor/cell line repository. Firefly luciferase reporter modification for bioluminescent imaging was done as previously described (Clark et al., 2016). Two micrograms of lineazed ATF5-DTR-GFP plasmid (Sheng et al., 2010) was transfected into GL261-luc cells in a 6-well plate using lipofectamine 2000 (Invitrogen) following manufacturer’s instructions. Medium supplemented with 200 ug/ml Zeocin (Gibco) was changed every two days to select positively transfected cells. GFP expressing GL261-DTR cells were sorted using a BD Aria III and washed with serum-free RPMI medium before injection. 250,000 cells were injected into the right frontal cortex at the coordinate Bregma, AP + 2 mm, ML +2 mm and DV −2 mm. DT treatment started at 7 days after tumor injection, at 1 µg/mouse/daily for 6 days (Figure 1) or at 1 µg/mouse every other day for six doses (Figures 2, 3 and 4). NOR test was performed during the dark cycle as previously described (Feng et al., 2016). Briefly, trials from the four-day test were recorded by an overhead camera and analyzed by an automatic video tracking system (EthoVision, Noldus). Animals with insufficient exploration (less than total of 3 s interacting with both objects) during training (day 3) or test (day 4) were excluded. Same object sets were used in NOR tests conducted at 13-16 days or 4 weeks tumor implantation (Figure 2AandFigure 2C,respectively), or 4 weeks after the completion of fWBI Figure 2C. Sample sizes (N > 8) were chosen according to our previous experiments where we can detect radiation effects on memory performance. Mice were euthanized and perfused with ice-cold PBS. Brains were quickly removed and half hemispheres were placed in ice-cold HBSS. Brain samples were dissociated using the Neural Tissue Dissociation kit (P) according to the manufacturer’s instructions (Miltenyi Biotech). Dissociated cells were then resuspened in 30% Percoll (Sigma) solution diluted with RPMI medium (Gibco) and centrifuged at 800 g for 30 min at 4° C. Cell pellets were washed with RPMI medium and resuspended in FACS buffer (1 x DPBS with 2% FBS and 0.5% BSA fraction V) and blocked with mouse BD Fc block (5 µg/ml, purified rat anti-mouse CD16/CD32, BD Pharmingen) for 30 min on ice. Cells were then stained with fluorophore-conjugated antibodies (BV711-CD45, AF700-CD11b). Data were collected on an Aria III sorter (BD) and analyzed with Flowjo v10 (Tree Star Inc.). After perfusion, the other brain hemispheres were immediately put into 4% PFA at 4° C, fixed overnight and then switched into 30% sucrose solution for at least two days. Samples were sliced into 20 µm coronal sections and stained with rabbit anti-Iba1 (1:100, Wako Pure Chemicals) and rat anti-CD68 (1:200, BioRad) followed by incubation with AF-568 goat anti-rabbit and AF-647 goat anti-rat secondary antibodies (1:500, Life Technologies). DAPI was used for nuclear counterstaining. Hippocampal images were taken using a Zeiss Imager Z1 under a 20x objective lens. The area of Iba1 +and CD68+signals were measured in ImageJ. Journal of Visualized Experiments e53287. Seminars in Radiation Oncology 19:122–132. Journal of Clinical Oncology 24:1305–1309. Current Opinion in Neurology 16:129–134. Developmental Disabilities Research Reviews 14:238–242. Free Radical Biology and Medicine 42:1133–1145. Brain, Behavior, and Immunity 36:147–155. Thank you for submitting your article "Rescue of cognitive function following fractionated brain irradiation in a novel preclinical glioma model" for consideration by eLife. Your article has been reviewed by two peer reviewers, and the evaluation has been overseen by a Reviewing Editor and Sean Morrison as the Senior Editor. The reviewers have opted to remain anonymous. The authors aim to investigate cognition in a glioma animal model following fractionated brain irradiation, a paradigm they claim previously difficult to assess due to variability in glioma burden and survival outcome. The authors find that microglial depletion during and after radiation ameliorates cognitive deficits associated with radiation of frontal lobe gliomas. Studying the cognitive effects of radiation therapy in the context of a glioma is a needed advance in the field. Based on data generated from this model the authors claim that the CSF-1R inhibitor PLX5622 (PLX) enhances the radio response of GL261 orthotopic xenografts and protects against radiation-induced impairment of recognition memory. This study highlights a possible therapeutic strategy for addressing the known effects of microglial inflammation on cognitive function after cranial radiation. While this new model is a useful tool to investigate the contributions of tumor burden to radiation-induced cognitive decline, there were several questions and concerns raised that would need to be addressed before publication, as summarized below. 1) This DT- Glioma model is useful as it allows for long term evaluation of cognitive deficits and provides proof of principle; however there are several caveats of the GL261 cell line raising questions regarding clinical relevance. Validating key findings using another documented primary tumor model would strengthen the study and claims, however If this is not feasible, it is important to clearly state the caveats and address points raised by reviewer 2 (below) in the Discussion. 2) The reduction in radiation-induced memory loss is apparent; however data regarding tumor radio response are incomplete and detracts from the strength of this study. Are the effects of radiation alone and PLX alone independent or additive in prolonging survival in tumor bearing mice? Please address specific comments raised by reviewer 3 (below) related to Figure 2B and provide the necessary data and analyses (radiation only vs. radiation + PLX; PLZX only vs. radiation + PLX). 3) More in depth and quantitative analyses of microglia numbers using resident and peripheral markers in each of the four conditions in Figure 3. It is difficult to assess from images shown in Figure 3B as mean fluorescent intensity if CD11b is not quantitative or a robust indicator of microglia 'activation'. - While the DT-mediated glioma growth control paradigm is novel, simply using a less aggressive – and more molecularly faithful – model of glioma would similarly allow for long term evaluation of cognition after radiation in the context of microglial depletion. My chief concern is the use of GL261 cells – a murine cell line from the 1990s driven by a KRAS mutation (a rare mutation in human gliomas). The molecular characteristics of the tumor can dramatically influence the inflammatory microenvironment of the glioma (see the recent report from the HERBY study, Mackay et al., 2018), and thus the potential influences of the tumor on cognition. Many well-documented xenograft and primary tumor mouse models exist that allow for assessment of cognition at 1 month post-radiation treatment and could be included in this paper to strengthen the claim that microglial depletion can rescue hippocampal-dependent (or hippocampal-independent) cognition following brain irradiation in the context of molecularly definable, faithful glioma models. - Whereas the reduction in radiation-induced memory loss is apparent, data regarding tumor radio response are incomplete and detracts from the strength of this study. The model uses diphtheria toxin receptor expressing mouse brain tumor cells and after orthotopic implantation diphtheria toxin to slow tumor growth. Addition of radiation then further slows growth to increase mouse survival time allowing for the expression of cognitive deficits. However, the effect of radiation alone on mouse survival is not shown. If 48 days post-IR survival (Figure 2) is required for expression of cognitive deficits, why not simply increase the radiation dose? The dose used (3x3.3Gy) is well below that used in the clinic. Moreover, is there an interaction between diphtheria toxin and radiation in terms of tumor response or is it strictly additive? This would be of value when evaluating the addition of a putative radio-sensitizing agent. With respect to new data, the survival response to radiation only (no DT) should be shown. - Figure 2B is interpreted as showing that radiation and PLX individually prolong survival of tumor bearing mice as compared to DT only, which is apparent from the survival curves and supported by the statistical analyses. However, the combination of PLX and radiation is then claimed to further prolong survival, which is not apparent from the survival curves (the individual curves are similar to the combination treatment) and the statistical analysis was not performed (i.e. radiation only vs. radiation+PLX or PLX only vs. rad+PLX). Moreover, if the effects of radiation only and PLX only on survival are independent, then the combination of radiation and PLX would be expected to result in an additive increase in survival. As presented, it appears that survival after the combination treatment is less than additive, which would suggest that PLX reduced the effectiveness of radiation or that radiation reduced the effects of PLX. The survival experiment shown in Figure 2B is not sufficiently long enough to accurately evaluate the claimed effectiveness of combination treatment and tumor response. We agree with the reviewers on that the current GL261-DTR model alone has some limitations however it represent the first proof of concept study addressing this clinically relevant problem. Given that it is not feasible for us to add another primary tumor model to the current study, we extended our discussion on the caveats of the GL261-DTR model, and articulated on the potential expansion of the application of our proof of concept study. Please also see our response to reviewer #2. We thank the reviewers for raising this important point and we apologize for not being clear regarding the objectives of the experimental design. The primary objective of our study was to study the effect of CSF-1R inhibition (with PLX5622) on cognitive function in a rodent tumor model that simulated a clinical treatment scenario. From our perspective, a primary limitation of many human-derived tumor models is the requirement for immunodeficient animals. Therefore, we used a rodent glioma cell line (GL261) that is syngenic with C57BL/6J mice which we and others have studied extensively with respect to the cognitive effects of radiation. However, following implantation with GL261 cells, tumors grow rapidly and animals require euthanasia within 3 weeks. Radiation alone in the doses we used does not prolong survival long enough for cognitive assessment. More importantly, patients usually have a therapeutic intervention which reduces tumor burden prior to radiation, which is what we attempted to model with the modified GL261 cell line. Neither diphtheria toxin or PLX5622 were intended to be used as radiation sensitizers or as primary therapeutic tools. To address reviewer 3’s comment, we performed a survival experiment with four groups: tumor only, tumor with radiation, tumor with PLX, tumor with radiation and PLX, and added results and discussion to the revised manuscript (see response to reviewer #3). We apologize for the lack of clarity on this point we now tried to clarify this and added new data. Figure 3A shows the comparison of CD11b mean fluorescent intensity across groups, this is calculated from flow cytometry analysis. The MFI is a quantitative measure of CD11b expression and has been used as indicator of microglia/macrophage activation (reviewed by Hoogland, et al., 2015). While the original Figure 3B and C were quantification of Iba1 staining covered areas and representative images from immunostaining respectively. In response to the reviewers, to support our claim, we now added quantification of CD68 immunofluorescent staining as Figure 3C. CD68 serves as a lysosomal marker for activated state of microglia/macrophages. We compared areas of Iba1 and CD68 staining across all groups. The new data demonstrated that the CD68 covered area was significantly increased after irradiation, and significantly decreased after PLX treatment. We updated representative images as Figure 3D. In the resubmitted manuscript, we made the following changes to the Results and Discussion. Updated reference: “Increased CD11b expression level has been used as an indicator of microglia activation during CNS inflammation (Hoogland et al., 2015)”. The Figure 3 legend was rewritten to reflect the updated graphs and images. We agree with the reviewer’s comment regarding the limitations of the current GL261-DTR model. The specific purpose for developing this tumor model was to mimic what occurs in an actual clinical setting by having the following features: i) an immunocompetent host, ii) fractionated radiation, and iii) reproducible tumor growth allowing evaluation of cognitive function with consistent timing. Although xenograft models that use human glioma cells are effective, they rely upon an immunodeficient host, which will result in a markedly different brain and tumor microenvironment, and different responses to radiation and CSF-1R inhibitor treatment. Unfortunately, adding another primary tumor model to test the cognitive outcomes in a separate cohort of animals is beyond the scope of this particular study, but we recognize that future experiments will need to address this question. Transgenic mice that develop spontaneous tumors rarely do so in a predictable manner and achieving sufficient numbers at similar ages to allow measurement of cognitive function would be a logistic challenge. We recognize that additional model systems will be required to further extend these results. We added a discussion to clearly state the caveats of the GL261-DTR model, and modified the discussion on the potential expansion of the application of our proof of concept study. The model uses diphtheria toxin receptor expressing mouse brain tumor cells and after orthotopic implantation diphtheria toxin to slow tumor growth. Addition of radiation then further slows growth to increase mouse survival time allowing for the expression of cognitive deficits. However, the effect of radiation alone on mouse survival is not shown. If 48 days post-IR survival (Figure 2) is required for expression of cognitive deficits, why not simply increase the radiation dose? The dose used (3x3.3Gy) is well below that used in the clinic. Most of the published rodent studies have used a single dose of radiation (usually 8-10 Gy), which we feel has a very different radiobiologic effect than fractionated irradiation as used for humans. The fractionation scheme we used (3 x 3.3 Gy) reliably produces memory deficits in C57BL/6J strain (Feng et al., 2016), and is comparable to other published reports. Although the treatment paradigm used to treat humans is very different (25-30 fractions of ~2 Gy), individual fractions of radiation in rodents require separate anesthesia each time which may also affect outcomes. Moreover, is there an interaction between diphtheria toxin and radiation in terms of tumor response or is it strictly additive? This would be of value when evaluating the addition of a putative radio-sensitizing agent. With respect to new data, the survival response to radiation only (no DT) should be shown. The use of a modified cell line (GL261-DTR) designed to respond to diphtheria toxin was intended to mimic the clinical situation of tumor treatment which results in reduced tumor burden prior to radiation treatment. To further address this point, we added the following treatment groups, tumor only, tumor + PLX, tumor + fWBI and tumor + PLX + fWBI, N=5 each group. The new data shows that radiation treatment alone significantly prolonged survival compared to the tumor only group (30 vs. 20 days of median survival, p<0.01), but this was not long enough for us to conduct behavior assay on the animals. In the survival dataset from our original submission, DT treatment alone was able to extend median survival to 39 days, and that DT + fWBI has an undefined median survival, These results suggest that there is a synergistic effect of combined DT and fWBI in tumor response. Therefore, DT in our treatment paradigm acted as a radiosensitizer, although it was not intended to be used as one. On the other hand, added PLX to radiation treatment prolonged survival compared to radiation alone (40 vs. 30 days, p = 0.087) group. This survival advantage (20 days longer than tumor alone) was longer than each single treatment group (4 and 10 days for PLX and fWBI groups, respectively). Therefore, tumor response to PLX + fWBI was more than additive than each single treatment. However, survival curves of fWBI and PLX + fWBI are not significantly different. Given that treatment interaction is not the main focus of the current study, we added these new data and analyses as supplemental figures (updated in Figure 2—figure supplement 1), and added the following text to the manuscript. The survival curve of the PLX and radiation combined treatment is not significantly different from the PLX or radiation treatment alone. The end point of this experiment was originally set to day 60 after tumor inoculation (mistakenly shown as 55 days in the original submission). We agree that the time was not long enough to assess our original claim. We have corrected the wording in the Results. We apologize for the error in the length of survival curve in the original submission. It has been corrected in updated figure 2, and Figure 2—figure supplement 1A and B. The statistics in our original submission were obtained using the day 60 data, there was no change regarding this matter. In addition to these changes, we added a Key resource table at the start of the Materials and methods. We thank Dr. Zhi Sheng from Virginia Tech University for providing the ATF5-DTR-GFP plasmid. Animal experimentation: This study was performed in strict accordance with the recommendations in the Guide for the Care and Use of Laboratory Animals of the National Institutes of Health. All of the animals were handled according to approved institutional animal care and use committee (IACUC) protocols (AN145279 and AN 142109) of the University of California, San Francisco. All surgery was performed under Ketamine/Xylazine anesthesia, and every effort was made to minimize suffering.